Need to Monitor Temperature? Go Wireless! Do you need a multi-channel temperature recorder to monitor & measure a product or process? Now the new WF-TC WiFi Thermocouple Data Logger from Accsense VersaLog has everything you need. 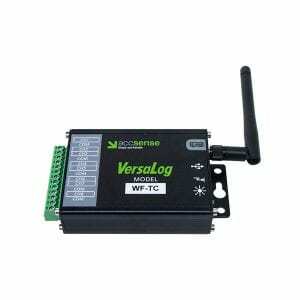 The VersaLog WF-TC is an 8-channel, battery-powered, WiFi-enabled thermocouple data logger. The intuitive SiteView software is compatible with Windows XP, Vista or Windows 7, 8, 10 and can be used to configure the loggers, retrieve data, graph measurements, and save/export the temperature data. Priced at just $688, these compact temperature recorders are available now from CAS DataLoggers. For more info, just call an Applications Engineer at (800) 956-4437. Accsense VersaLog data loggers are a powerful and cost-effective solution for data recording applications. These portable data loggers commonly feature 7-8 channels with models to log Temperature, Current, Voltage and more. Our new WiFi loggers incorporate a standard 802.11 b/g/n interface for wireless network connection when externally powered. Meanwhile an optional USB device server allows multiple VersaLog loggers to be connected to a single Ethernet port for remote network access. All VersaLog data loggers have a built-in USB port for connection to a PC for configuration and downloading data. Each data logger has an auxiliary serial port and two programmable alarm outputs which can be configured with low or high limits to activate a relay, audible alarm or signal a PLC. The WF-TC wireless data logger records temperature data using its eight thermocouple inputs and saves the data to its large 8-MB memory. The device’s 16-bit ADC makes it especially ideal for science and laboratory applications where precise and accurate measurements are critical. For standalone data collection, Accsense VersaLog’s aluminum enclosure allows it to record even in the harshest industrial environments. The embedded WiFi module allows remote data monitoring and downloading. Simply power the logger in a WiFi-covered area and then access it from a PC for configuration, downloading, graph viewing and more. Siteview software is a Windows-based application which works with VersaLog Series data loggers for downloading, configuration, data analysis, and plotting. Its user-friendly graphic interface and powerful functionality fit both new and advanced users. Its versatility of custom equation and custom-line equation can handle complicated measurement requirements. SiteView also offers the ability to view data in real time from any and all connected data loggers. Meanwhile a powerful calibration tool converts the raw sensor output to physical parameters. For alarm applications, an alarm management tool allows local or email notification of alarm conditions from any connected logger. Note: SiteView software is required and sold separately. Limit one license per site, which can be used with multiple loggers. For more info on the Accsense VersaLog WF-TC WiFi Temperature Data Logger, or to find the ideal solution for your application-specific needs, contact a CAS Data Logger Applications Specialist at (800) 956-4437.